Humphry Davy School are working with a company called ‘Future First’ to set up an alumni association for all former students (not just from 1980 onwards). One of the main purposes of the alumni association is to keep in touch with ex-students and draw upon their expertise in order to support their Careers programme (inspirational speakers for assemblies, mock interviews, work experience placements etc. ), mentoring programme (raising aspirations) and fundraising efforts. It is also their intention that the alumni association will be able to offer wider networking opportunities for former students as well. The alumni association is not intended to be an alternative to the OPA – the main purpose is to raise aspirations and opportunities for current students – but the school has asked if we could encourage members of the OPA, regardless of when they were at school, to sign up to the association. We are happy to comply and look forward to working with the school in this new venture. These students are either doing or have done something which the school feels deserves special recognition. It could be, for example, caring for siblings and / or other family members, coping without complaint with difficult family situations or overcoming personal hurdles. The school wants to send them on a sail training yacht for six days to give them a lifetime experience, and at the same time broaden their horizons, increasing their self-confidence and self-worth and teach them team work and leadership skills. They have been selected because they deserve the opportunity, not because they can afford it but because of the criteria the school has used for selection. Practically all the students suggested are from financially challenged backgrounds. Humphry Davy School offers a lot of opportunity for students to travel and gain experience of life, but find it is usually the same students who take those opportunities because their families can afford it. The aim with the Rona activity is to take students who cannot necessarily afford it, but have earned the chance to take part. As a school, it has not got the funds to subsidise students for this type of activity, however deserving those students are, so it is asking local people and charitable organisations if they would be willing to offer sponsorship. The cost per student is £265. The committee of the Old Penwithians Association has decided to support this appeal in a joint sponsorship with the Penzance insurance company Christopher Rowe Limited (CRL) by providing the funding for one student (50% each). The link with CRL is entirely appropriate given that Chris Rowe is an old boy and CRL’s main business is marine insurance. If anyone would like to make a contribution to the association’s half of this sponsorship please contact the OPA Treasurer, Paul Tyreman – see the “Contact Us” page. After a few disappointing cancellations in 2014 and 2015 it was a great relief to stage the OPA Golf Day in fine weather. The course at West Cornwall Golf Club, Lelant, was in fine condition and we were all made very welcome by the staff and catering team. 20 players started but due to a trolley breakdown for Chris Roach (49) during the round only 19 finished. 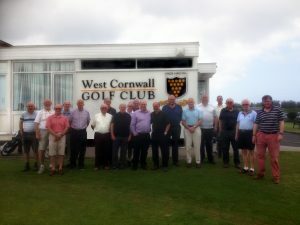 Of the 19, there were 15 WCGC members and 4 visitors, with Alan Perkins (52) travelling the furthest as he made his annual trek from Chippenham. I am sure that Andrew Coak (55), who initiated the day and organised it for many years, would have been very proud of the good turnout. David Morgan, Mike Jose, Tim Martin, Alan Perkins, Don Ruhrmund, David James, Ian Badcock, Roger Dugdale, Philip Thomas, Clive Rowe, Ian Hanley, Rob McCabe, Paul Reed, Jimmy Glover, Jon Cox, Antony Richards, Frank Blewett, Chris Dale, Larry Magor. Everyone took the opportunity in the bar afterwards to share memories of their exploits on the course and memories of school as well as the intervening years. I will make sure that we establish a permanent date in the club’s diary for this event and I look forward to welcoming even more old boys to our day in 2017. The funeral of old boy and former member of staff James Peak Treglown (class of ’41) has taken place at High Street Methodist Church, Penzance. Jim’s middle name, Peak, was a related surname on his maternal side and the Peak family had a long association with High Street Methodist Church. A number of old boys from Jim’s era attended as did several former colleagues at the old grammar school: Chris Goninan, who delivered the eulogy; Bob Quixley; Bob Conybeare; Goff Johns; Mrs Pat Robson and Bill Burnett. Secretary Stuart Guppy represented the Old Penwithians Association and our treasurer Paul Tyreman also attended both as a member of the OPA and as a former pupil. Jim was born at the family home in Alma Terrace, Penzance – his father was a dispensing chemist in the town. He joined PCS in 1941 with school number 2042 and at school he showed great promise in science subjects, especially chemistry and biology. He also played violin in the flourishing school orchestra. Jim left school with excellent school certificate results and spent two years at Plymouth & Devonport Technical College studying pharmacy before doing two years National Service in the Army Medical Corps; where he was quickly promoted to sergeant because of his qualifications. He was an instructor, and found great satisfaction in teaching. After National Service Jim spent several years working as a pharmacist in his father’s business, but in 1953 returned to college to retrain as a teacher. After qualifying he taught chemistry at Saltash Grammar School for one year before returning to Penzance to teach chemistry at PCGS; another old boy who returned to the school as a member of staff. Here he acquired the nickname “Trigger” which stayed with him to the end of his career. Outside the classroom Jim played second violin in Penzance Orchestral Society for many years. He was also a very keen and talented photographer, being a Member of the Royal Photographic Society (MRPS) and a leading member of the Penzance Photographic Society. His lectures and evening classes were held in high regard. Jim established a photographic society at the school and generations of photographers learned their craft under his tutorship, the dark room was in constant use, and he had responsible for taking the identity photographs of all boys entering HDGS. Jim retired in 1984; he embraced the development of digital photography and began painting in oils, often working with former colleague and fellow retiree Bob Quixley. He also worked as a locum pharmacist at Hamer’s Chemists in Penzance. Failing eyesight meant that he eventually could no longer continue with his painting and photography so Jim turned his attention to his garden. It was while in his garden that Jim died suddenly.